In Books Tagged In American Revolution, De Lorimier, French-Canadian Explorers, History, Missouri, North American History, Quebec, and Seven Years' War. 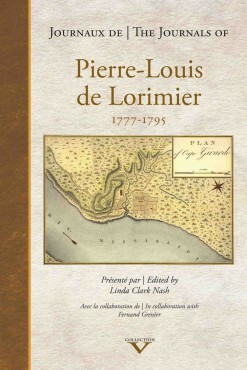 The founder of Cape Girardeau, Missouri, Pierre-Louis de Lorimier, a French Canadian from the Montreal area, left three journals written between 1777 and 1795. The three texts meticulously transcribed are now published together for the first time in the original French and in English and richly commented. Lorimier’s journals are an invaluable contribution to understanding the confrontations in that key period. They also cast new light on the consequences for the nascent United States, Great Britain, Mexico, the Native American nations, and the French Canadians, who had been left in limbo after the Seven Years’ War and the Conquest of New France in 1763. Born in New France near Montreal in 1748, Pierre-Louis de Lorimier and his father were drawn by adventure and the fur trade to the huge territory south of the Great Lakes. Between 1769 and 1794, Lorimier operated out of different trading posts on tributaries of the Mississippi before settling at Cape Girardeau in the Missouri Territory and becoming commander of the post. Born under the French crown, Lorimier was successively a British subject, a Spanish subject and finally an American citizen. Never before have these three journals been published together in their original French with an English translation. Nor have they been presented with such detailed and reliable information. People interested in the fascinating early history of North American, and particularly the Mississippi and Missouri Valleys, and of the peoples who have inhabited the area, will enjoy this book. It takes readers back to the life and times of an early French Canadian explorer as told in his words. Linda Clark Nash is a historian, educator, and administrator whose historical focus is French and Spanish colonial history in the Mississippi Valley. She lives in Jackson, Missouri where she taught history for 31 years. She was very involved in commemorating the anniversary of the Lewis & Clark expedition in Southeast Missouri and in celebrating the memory of the founder of Cape Girardeau, Louis de Lorimier. Fernand Grenier has a PhD in history and is an expert on the early exploration and travels of French Canadians in the Mississippi and Missouri territories. He lives in Quebec City.